Pantiya Bungalow is approximately 1½ hour drive from Colombo over 60 miles. The Southern Expressway is approximately 6 miles from Pantiya Bungalow which eases connectivity to the bungalow from Katunayake International Airport as well as to popular cities in the south of the Island such as Galle, Matara and Hambantota. Driving from Colombo, on the Galle Road, about 1 km from the Kalutara Temple, turn to your left inland at Katukurunda Junction. Keep driving until you pass the Nagoda General Hospital. Upon passing this large hospital, take a right turn at the next big cross junction towards Mathugama. This large, carpetted road will lead you to the town of Mathugama. Next to Lakpriya Stores and Dharmadasa Grocery, there is a road called Welkandala Road, which will convey you right up to The Bungalow driving through the Pantiya Estates rubber fields within an approximate 20 minute uphill drive. Please call us for directions if you get lost! The Bungalow's land line number is 0345 081 341. The nearest large town to The Bungalow is Matugama town. The town is approximately 2 miles away from the property. 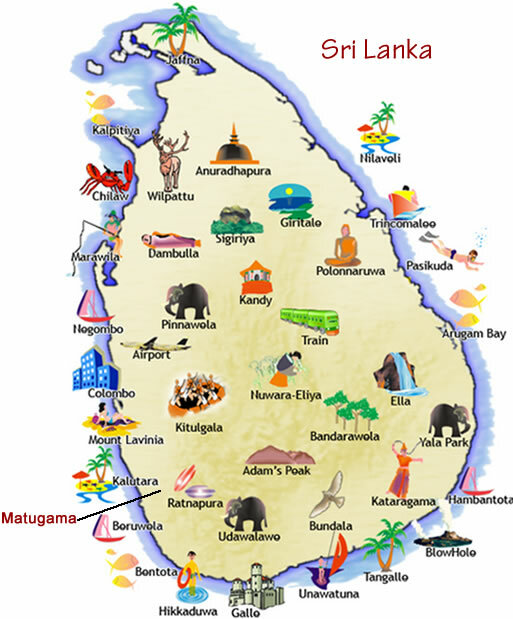 Matugama is a bustling town which is approximately 1½ drive /60 km from Colombo. Matugama is 25 km from the beach village of Bentota. Despite its distance from the major cities, most products and services are available from banking to grocery shopping. The Sunday market is very popular in the Matugama Town as inhabitants from surrounding villages come here to purchase fresh produce.